Lindsey Beckley: Ghost stories go back…way way back into the depths of history. All the way back through oral traditions and to ancient Mesopotamia and Egypt. In the Torah, King Saul has the witch of Endor summon the ghost of the prophet Samuel. And Roman Author Pliny the Younger of the first century A.D. penned one of the earliest widely known ghost stories. Beckley: In the late 19th and early 20th century, American newspapers were one means of spreading popular ghostly tales. With the rise of spiritualism, which is a belief in the possibility of communication between the world of the living and that of the dead, interest in paranormal activity in general was on the rise, making ghost stories very popular with readers. In this episode of Talking Hoosier History we will share just a few of the many tales of terror hidden in the pages of historical newspapers. Beckley: Now, before we get started, I wanted to give a bit of a warning. I’ll be telling some rather spooky stories in this episode and a few do include violence. If you don’t like scary stories, perhaps this episode isn’t for you. If you do like scary stories…well, get some popcorn and shut off the lights and brace yourself for some historical horrors! Beckley: Let’s turn the clock back to the late nineteenth century. First, we visit the The Society for the Advancement of the Belief in Ghosts, in Montgomery County, Indiana. Otherwise known as the Crawfordsville Ghost Club. The following account of the club was found in the October 31, 1891 issue of the Sacramento, Record-Union. The society was founded on All Hallows eve in 1887. Every year, new members were inducted on the anniversary of its founding, and each new member had to meet one qualification: they had to swear to have seen, with their own two eyes, an apparition…a spook…a specter…a haunt…a ghost. At the meetings, held every two weeks, club members gathered to hear a new tale of a spectral encounter recited by one of their fellows. As if the topic of the talks wasn’t eerie enough, the club-room or “ghost lounge” as they called it, was downright spine-chilling. Walls, floors, ceilings, and even windows were covered in white. In contrast, every piece of furniture was “black as midnight.” In each corner of the room there was a skeleton and in the skull of each skeleton, a lamp glowed red. These ghastly watchmen provided the only light of the chamber. Voice actor reading account from Record-Union: “It must have been almost midnight when I was awakened by hearing my horse in the room below give a terrified scream which sounded almost human. Before I was fairly awake I heard him tearing from the mill-room out into the night. The rain had ceased to fall, and the last beams of the declining moon lighted up the large room through its one great window with an unearthly glow. Startled by the commotion made by my horse, I sat up in my corner, and was in the act of raising my hands to rub my eyes when I fell back in a helpless heap, for coming up the stairway from below I saw a ghost! An old man with a set and care-worn face, a fierce, haunted light shining in the eyes, which seemed to see nothing, a trembling hand which drew tightly around his slight, bent form a bright scarlet cloak – that was a ghost. Overpowered with conflicting emotions I sat breathlessly watching my strange companion from another sphere. He saw me not, but, murmuring and gibbering to himself, began to pace the room. I could not distinguish all his speech, but “ruin! Ruin! Ruin!” was the burden of the self-communication. At first he passed quite close to me as he walked about the musty wareroom but gradually his circle became smaller and smaller as he nearer the center. Finally he paused almost at the edge of the chute and groaned. I was gazing intently at him, when suddenly he took a forward step, and like a flash shot down the chute with a shriek, which still is ringing in my ears. This cry broke the spell which bound me, and leaping to my feet I rushed down the stairs and fled out through the bushes, which were dripping with water, and which cut and chilled me as I brushed them hurriedly aside. I paused not until I reached out camp, and fell almost fainting among my companions, who had been awakened by the arrival of my horse some time before, and who were just preparing to set out in search of me. Beckley: The next day, the narrator returned to the mill with two companions. Upon examining the room where the episode occurred, they found the scarlet cloak discarded on the floor. One of his companions declared that it had been no ghost but a distraught and deranged man the narrator had encountered. Looking for proof, he prodded a stick down the chute. He encountered an obstruction, which he investigated further by prying open the chute. There, long dead and mummified, they found the corpse of the miller, his skin yellowed and his face still bearing the traces of the agony which filled him in the last moments of his life. In our next story, we visit another hunting party. But unlike the narrator of our last story, this party is hunting not game…but ghosts. But first, let’s take a quick break. Beckley: If you’d like to read stories similar to those we’re sharing today, you can find many many more with Chronicling America, the Historic American newspaper digitization program from the Library of Congress. For example, the article “How We Explored a Haunted House” appears in the October 25, 1919 issue of the Richmond Palladium. This, along with over 12 million pages of newspapers can be keyword searched, online for free at chroniclingamerica.loc.gov. That’s chroniclingamerica.loc.gov. Read yesteryear’s news today. Voice actor reading from the Journal-Gazette: Wednesday night was moonlight and the young men and boys organized for a ghost hunt. They surrounded the district and closed into a common center, a pair travelling through every alley and street. Two saw the ghost…both fired point blank at it. Others drawn by the shots and shouts joined in the pursuit in vain. The ghost led the crowd a chase of five blocks, making no sound, and disappeared. Beckley: Perhaps the hunt succeeded in driving the ghost away as there were no further reports of ghostly activity in the Journal-Gazette. But the Hoosier hauntings continued elsewhere. Beckley: The citizens of Goshen weren’t the only ones who thought gunshots could solve their ghostly problems. Next, we visit a farm on the outskirts of Yorktown in Delaware County where the paranormal activity was a daily occurrence for the 1901 residents. Beckley: That November, two newspapermen from the Indianapolis News were discussing the topic of ghosts. In their conversation, a house where “all kinds of funny things” happen was brought up and decided that that was just the sort of place they needed to visit for their next story. Beckley: Upon their arrival at the infamous home, which was located about a mile from the village of Yorktown, they saw one of the handsomest buildings in the area, despite it being rather lonesome looking. They introduced themselves to the Burgess family, a young couple and their 6 year old son. The family had lived there for over 6 years and had amassed quite the collection of spooky stories in that time. Voice actor reading from newspaper account: There are a lot of people around here that have seen the ‘haunt’ and they all believe in it. Of course, I don’t know what it is, but some strange things have happened since we have lived here… I have heard groans coming from that room upstairs, and I have heard things rolling over the floor and the sound of music, just like someone was playing the violin. And I have heard people laugh and foot-falls on the stairs as of someone were coming down, but no one ever appeared. Beckley: Aside from these occurrences, there was a more physical reminder of the tragic event which occurred in the home. At the top of the narrow, dark, winding stairway, there was a storeroom. The investigators gathered in the dimly lit room and Mr. Burgess stated that it was in that very room that the tragic events unfolded on that night so long ago, and it was from that room that most of the sounds emanated. Pulling back an old mattress, a large, dark stain was revealed. Burgess claimed that the stain was from the lifeblood of the good doctor pooling on the hardwood floors. Voice actor reading newspaper account: A number of times…I have shot at him often, but I never have been able to hit him. He rides a sort of dark horse, just like the doctor used to ride, and he is sort of thin and misty like, and has no head. He generally starts at the barn, but I have seen him out in the road there in front of the house. Voice actor reading newspaper account: Not a little bit. A ghost can’t hurt anyone, and as long as I know it can’t hurt anyone I am not afraid of it. Beckley: It seems to me, though, that a man so confident that a spirit cannot hurt him would not waste good bullets shooting after a galloping ghost. Another haunting that originated with a tragic death can be found in the pages of The Fort Wayne Journal-Gazette in 1907. Well known Hartford city farmer Edward Preston Sanderson went missing on October 22, 1904. Nine days later, on October 31st, fittingly enough, his body was found in a nearby pond, weighed down with stones. Several people were arrested, charged, and convicted of his murder, but that’s not where his story ended. Over 2 years after his untimely death, reports of a haunting began to surface. Voice actor reading from newspaper: Sunday night at about 1:30 George Upton… and a young lady were returning in a buggy from a visit to friends in the country. When they reached the place, near the water street bridge, where shortly after the finding of Sanderson’s body in the Croninger pond spots of blood showed the body had been dragged in order to reach the pond, Upton saw what seemed to be a man crouching down by the fence at the side of the road. Before he reached the bridge he saw the man standing erect at the roadside but as he came opposite the figure it crouched down as if to escape observation. Beckley: He may have thought nothing of the incident, except for the fact that his companion, sitting right next to him, saw nothing of the figure lurking in the dark. Voice actor reading from newspaper fades in: Upton was positive that he saw it and the more he thought of it, the more mysterious it seemed. What made him the more confident that his eyes had not deceived him was that his horse shied at the object and came near running away. Beckley: Once Upton came told of his experiences, several other residents came forward with similar stories; they were riding at night and passed a lurking figure that seemingly only one person in the group could see. Two different theories were put forward to explain these experiences. One, the restless spirit of Edward Sanderson was returning to the place his body was dragged across the road. And two, the figure was actually a human being, Sanderson’s murderer who escaped justice while others were tried for his crimes. He was returning to the scene of the crime either in remorse or in order to relive his crime. Either way, I’d certainly stay off that stretch of road in the wee hours of the morning. That’s all the time we have today for spooky stories; remember, you can read more ghost stories from the pages of history with the newspaper digitization program Chronicling America at chroniclingamerica.loc.gov. Once again, I’m Lindsey Beckley and this has been Talking Hoosier History. As always, thanks to Jill Weiss, our sound engineer extraordinaire, and to Justin Clark, the voice of all newspapers here on the podcast. 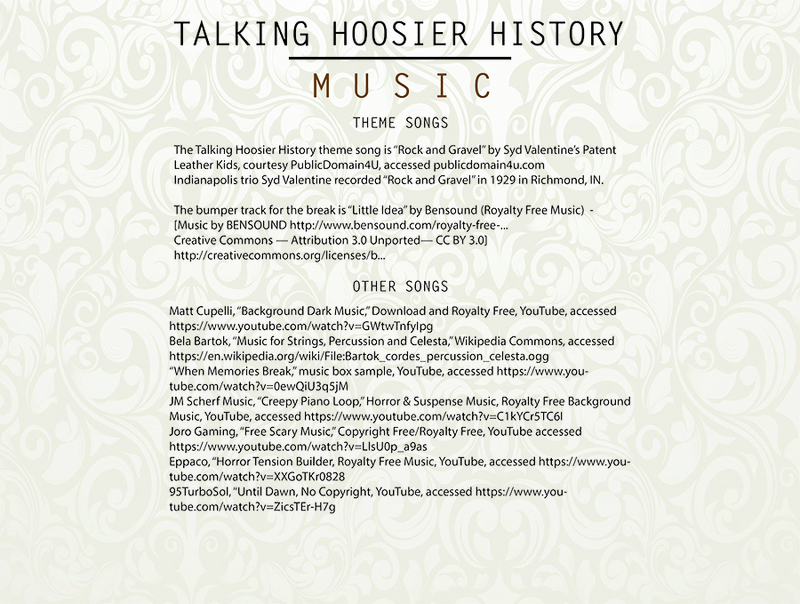 If you want to stay connected, you can find us on facebook at Talking Hoosier History and on twitter at @TalkHoosierHist that’s H-I-S-T. And if you want to help us grow, please subscribe, rate and review Talking Hoosier History wherever you get your podcasts! Thanks for listening! “Body Found in Pond and Weighted Down.” The Star Press, November 1, 1904. “Death Frees Cook From Reformatory.” Muncie Evening Press, April 6, 1907. “Tale of a Hoosier Haunted House.” Indianapolis News, November 2, 1901. “The Ghost Club.” The Record-Union, October 31, 1891. “The Haunted Farm-House.” The Indianapolis Journal, July 24, 1892. “Hundreds Saw The Goshen Ghost.” The Fort Wayne Journal-Gazette, February 7, 1909. “See Pres Sanderson’s Ghost?” The Fort Wayne Journal-Gazette, March 3, 1907. Jill is the outstanding sound engineer for Talking Hoosier History. From selecting awesome music and sound effects to setting up equipment to uploading content, Jill is a Jack of all trades! Justin is a project assistant with the Hoosier State Chronicles newspaper digitization project. Justin is the voice of newspapers here on Talking Hoosier History. In this episode, you heard his very best Vincent Price impression! If you’re interested in reading historical newspaper articles, visit Hoosier State Chronicles online.